PinkyPiggu: Moosehead Kitchen & Bar @ Telok Ayer Street ~ Pulsating With Edgy Vibes & Delicious Food! Moosehead's location along Telok Ayer Street (right across DT18 Telok Ayer mrt station) is definitely a convenient one and serves as a value-added gastronomic presence to the fringe of our central business district and Chinatown area. The corner pre-war shophouse unit's narrow configuration might not be the most spacious, but each nook couldn't be more interesting with its quirky and eclectic furnishings. Have a look closely, many are preloved items cleverly given a new breath of life. Wardrobe doors now function as gargantuan wall mirrors, a flea-market wall rack holds wine glasses, and you might find yourself sitting at a table with vintage cast-iron sewing machine legs! Another attention grabbing feature is the stunning graffiti-like mural, collaboratively hand painted by Moosehead's Chef Manel and Singaporean street artist, Samantha Lo (aka the sticker lady) after a chance meeting outside the restaurant. I say, talented people intuitively flocked together! It's easy to elope into subversive mood of the entire space. So free-spirited and unpretentious. The restaurant is owned and operated by Daniel Ballis, while Chef Manel Valero (formerly of FoodBar Dada) helms the kitchen. Both have traveled extensively, and the inspiration from their 'investigative wanderings' are apparent in Moosehead's non-mainstream cuisine which is most suitably described as having a global edge, free-style with a core Mediterranean flavor and influences from around the world, including Japanese and Southeast Asian cuisines. Though the menu evolves regularly with innovative new creations, some of their popular dishes such as Asparagus with Leek, Chargrilled Sea Bass with Eggplant and Gula Melaka Frozen Foam have become the main-stayers. As we soon found out, the charcoal grill oven is Moosehead’s pièce de résistance, where smokey delights are being churned out. Chef Manel's ingenious flair in producing combinations of flavor and texture that seem improvisational yet are finely balanced is gloriously displayed from the moment we commenced with a seemingly simple tapas-style starter of Bacon-wrapped Chargrilled Dates ($8). As I bite into each tiny morsel, the robust burst of densely packed salty-sweetness with a touch of creaminess from the roast garlic aioli and crunchiness of pine nuts, was beyond describable excitement. The initial taste somewhat reminded me of bak kwa (barbequed sliced pork), yet layered with a soft complexity which had me hypnotically hooked. No doubt the pairing of each component was thoughtful and well-crafted as a whole. Highly enjoyable! 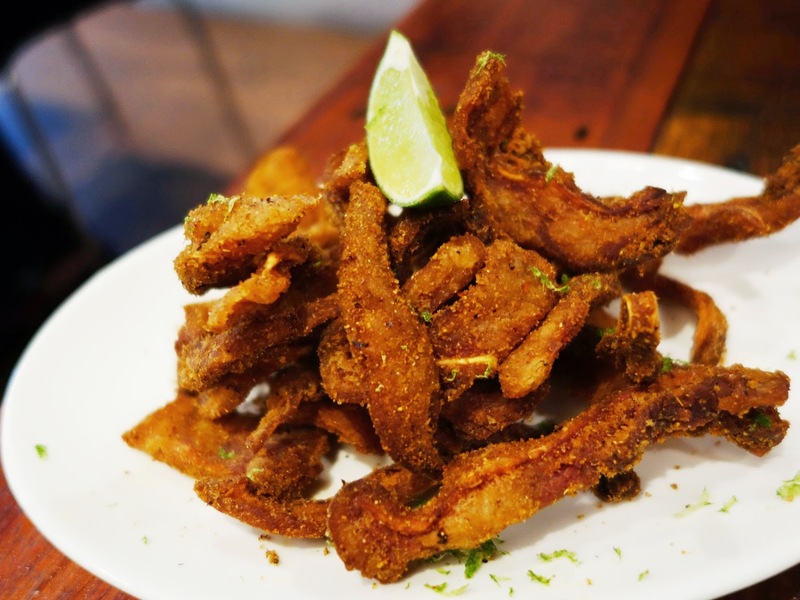 Another addictive starter which we can't keep our mouths away from was the Crispy Spiced Pigs' Ears ($16). Sounds exotic, but the familiarity of deep-fried golden brown crispiness and Indian accents of fragrant cumin and coriander (dhania) powder would have you nibbling on the unusual crunchy cartilage in no time. This should be a staple bar food, my friend enjoyed it immensely with his beer! The Chargrilled Asparagus ($14) is worth highlighting too, delightfully crunchy with hints of smokiness complemented by a subtlety-flavored garlic miso sauce and heightened with a release of aroma from the fried leeks. Grilled Avocado ($16) with ajoblaco (cold Spanish soup made of almonds, olive oil, bread & garlic), ikura (salmon roe), puffed quinoa and topped with shavings of frozen apple, was amazing on the palate as much as it was visually pleasing for the eyes. Being a tomato and cheese lover, I would also recommend the Grilled Vine Tomatoes ($18) with bonito and balsamico, as well as the Burratina with Basil Oil ($21), both which goes well with a serving of warm Turkish Bread ($8) dressed in balsamico and olive oil. If I have to vote for the most memorable dish of this meal, my choice would go to the Grilled Octopus ($35). Executed to moreish perfection, I was first wowed by the tentacled sea creature's faultless tender succulent texture, before being enveloped in its enjoyable saltiness which was nicely balanced out by the slightly tangy red pepper and lime sauce. The handling of an octopus dish can be very challenging under less than skilful hands, but any worries of it being rubbery and chewy were soon cast into oblivion. Truly an excellent dish which you've have to experience yourself to fully understand its merits. We moved on to the more substantial protein mains, superbly well-marinated Chicken Bulgogi ($18) grilled to tender deliciousness and served with a wasabi (horseradish) sauce which has a pleasant tame sharpness to it. I thought the chunks of chicken thigh was good, but the next two dishes were even better! The Beef Onglet ($34) rested inconspicuously amid the garden of teriyaki mushrooms, sweet potato crisps and bonito flakes, but quickly shone with its delectable beefy flavors and ideal medium rare doneness with light charred edges. Using only premium cut that is between the shoulder blade and loin of prized Iberian pigs, the Secreto Iberico ($28) impressed with its straightforwardness: supple meat, lip-smacking juiciness and ambrosial smokiness. The minimum seasoning of salt was just right to bring out the wondrous flavors of the pork's fats, rendering the dip of fresh tomato puree with wasabi a tad unnecessary. Though neatly presented in slices on a wooden board which made it easy for sharing, I secretly wished I can have it all to myself! This is to live for! Rounding up with desserts, we had Plum & Mixed Berries Tart ($14) with crème fraîche, as well as the Mexican-inspired Chilli Pineapple Ice Pop ($14). Topped with Asian elements of gula melaka (palm sugar) frozen foam, banana cream and sprinkling of chocolate shavings, the popsicle may not be much of a looker, but its refreshing citrusy taste won praises from everyone at the table. A totally brilliant combination which showcased the creativeness of Chef Manel!